Soak rice in water for half an hour. Strain water and grind well. Keep plantain leaf on flame, then take it out from the flame (this is done to fold the leaf without getting torn). 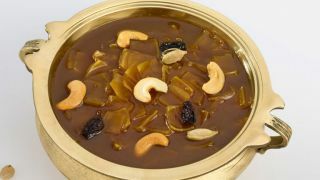 Dissolve 100gm of jaggery in boiling water and strain it. Mix this jaggery syrup with the ground rice and mix well to make it like a dosa batter consistency. In the plantain leaf, pour the batter carefully (with your hands). Roll the plantain leaf and tie both the ends of the leaf with the thread of plantain. Boil water in a pan. Put the plantain leaf in this and cook for half an hour. When it gets cooked, pour cold water above the ada and let it cool. Take the ada carefully out of the plantain leaf. In a pan (uruli), add water and let it boil. Dissolve the remaining jaggery in it. Cut the ada into small pieces. Let the jaggery syrup boil and thicken. Now add the ada into it. Add ghee and sauté continuously. Now, grate the coconut and take 2 cups of thick coconut milk and 4 cups of medium thick coconut milk and 4 cups of thin coconut milk out of it. When the jaggery thickens with ada, add the thin coconut milk. Keep stirring. Add 4 cups of medium thick coconut milk and continue stirring. Let the mix thicken. Finally add the thick coconut milk and cardamom powder to it. Roast cashew nuts and raisins in ghee. Add this to the payasam. Tasty ada payasam is ready.